If you follow my Facebook or Twitter, you might have seen some pictures from the Tour de Scottsdale. Me and my sweet hubby did the 70-mile bike ride. It was my FIRST group race-type situation, and let me tell you, starting out with hundreds of people around me…kinda intimidating. But…now that it’s all over, I can say I’m kinda proud of the accomplishment. Last year I ran a marathon, so this was another thing to check off the list, so it’s exciting. Here’s a little picture of me and my sweetie holding up our medals we got for finishing the 70-miles. So…onto the next adventure: 207 mile bike ride to MEXICO!!! 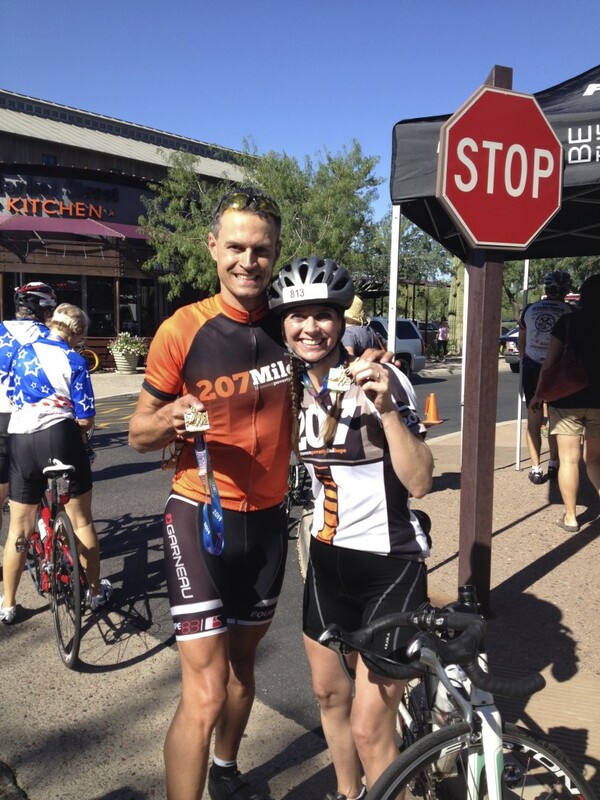 This entry was posted in Exercise and tagged 207, Tour de Scottsdale by Lynn Rush. Bookmark the permalink.